Most of my little class I taught this past year in our Classical Conversations co-op. How do you homeschool and keep it fun at the same time? Well, for one thing, school does not always have to be fun. School is work for children and work is good. I do think children need to learn that most of the time in life things aren't fun and exciting. I try to instill in my children a strong work ethic. But that being said, I do want to make learning fun or at least interesting. I think the main thing my children would say is fun about homeschooling is the read alouds we do. They also really like the memory work we do with Classical Conversations, particularly the songs (this is how we learn the time-line, history facts, and our mulitplication tables.) We also do fun field trips at least once a month and they also love our homeschool co-op. I think also not dragging school out the entire day helps as well. We must remember that the experts say that 1 hour of homeschooling is equal to 3 hours of traditional school. How do you homeschool during stressful times? There have been many times of stress over my 18 years of homeschooling, including family illness, death of loved ones, miscarriages, etc. I think the main thing is to try to keep as much of a schedule as you can. This is comforting to the children, even if not much school gets done. This is one reason that I have my daily homeschool schedule posted in the kitchen and school room. That way if my husband, an older sibling or sitter is watching all the kids then they can follow the schedule too. Remember that real life situations are a great learning tool for children. It's Ok to take a break from school for a while too. Just read good literature to them, or have them read it themselves if they can, and do some math drills everyday. You can make up things in the summer if need be. How do you homeschool with a newborn? Some of the answers to this question are the same as the above and I also dealt with this in my post I wrote after I had #10 entitled, "I Won't Lie, It's Hard." I do take a babymoon and don't do school for 2 weeks after the baby is born. Then we ease back into it pretty easy the first week and then the following week go full swing. I find in someways it's easier to school with a newborn than with a toddler (that would be another post : ) I just keep the baby with us and nurse him or her as needed. I relax the schedule somewhat and keep our outside activities pretty low until the baby is at least 2 months old. How does your husband fit into the homeschooling picture? My husband was the first one to ever mention homeschooling about 19 years ago and has always been a real encouragement to me. This definitely helps but he also has a very busy career with 10 hour days away from home and traveling a few nights a month as well. So he is considered our principal but that is about it. There have been times that I have tried to assign a certain subject for him to do with a child, but it never seemed to really work out and put undo stress on him. He does help in the evenings with the older children's papers (he is a better writer than me and better at editing.) He loves to hear in the evenings what the kids have learned, particularly their memory work. He also reads to them in the evening, either Bible stories or a read aloud that goes with the history we are studying. I feel that my "job" is homeschooling my children and I let my husband do his. And remember if you want your husband to support you in your homeschooling endeavors, don't complain (at least not too much, smile) or he will want to put them all in school. Love your picture of the children. Seeing the different ages of the kids, don't the younger ones learn what the older ones are working on? So, as a result, they are finished with the lessons at an earlier age. So could you have 10 yr olds ready for college? Haha Kristine, that would be really nice but it doesn't quite work that way. My youngest do glean a great deal from what I'm teaching the older ones, especially when it comes to history, science, phonics and even math skip counting. But I do have to actually teach them their grade level math and language arts. Their eyes start to glaze over after about an hour of school with the others and they just want to play and start zoning everything else out : ) I have had one skip a grade who public school would of put her a year back so that is one advantage to homeschooling, you can put each child in the grade they are ready for and don't have to fit into anyone else's box, so to speak. 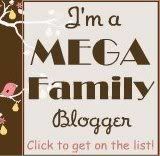 Your blog is one of my all time favorites - just FUN to read!